Felice and Boudleaux Bryant were a hugely successful American husband-and-wife songwriting team. I've invoked their names hundreds of times over the years when asked about songwriting and songwriting royalties. They wrote 6000 songs and sold over 200 million records. Their list of hits includes “Bye Bye Love,” “All I Have to Do Is Dream,” “Wake Up Little Susie,” “Love Hurts” and “Rocky Top.” The one I wave around while giving my songwriting speech is "Love Hurts”, a song I first heard in 1961. I would never have imagined at the time - I was 11 - that those words and that melody came from anywhere other than Roy Orbison’s own tortured heart. He sang every word with conviction and sincerity and delivered every note of the melody as though it was occurring to him as he sang, there in front of the microphone in that mysterious non-place where I imagined hit records were created back then. I suppose I believed, in an unquestioning and not very thorough way, that all the songs I heard on the radio were emotional communiques that originated with the singers performing them. It wasn’t till I started writing songs myself that I began to learn more, and think more seriously, about the song writer’s art. By 1975, I’d co-written the eight songs on the first Trooper album. Two of those songs, “Baby Woncha Please Come Home” and “Good Ol’ General Hand Grenade” shared the Canadian charts that summer with another version of “Love Hurts” – this one recorded by a Scottish group called Nazareth. Regardless, while all five of these strikingly different performances showcase the unique singers and musicians that created them, one important thread remains consistent throughout: the lyrics and melody wedded together by Felice and Boudleaux over fifty years ago. The songwriting royalties generated by the record sales and airplay of all the versions of “Love Hurts” went to the Bryants and, now, to their heirs. This will be the case with the iTunes track released last week by Jacob Lusk and will continue to be the case if another talented artist or group chooses to record the song in the future. I'll return to another Nazareth hit, "This Flight Tonight" in part two - once I write it. Roy Orbison's cover of "Love Hurts"
Nazareth's cover of "Love Hurts"
Jacob Lusk's American Idol performance of "Love Hurts"
*I was honoured to have the opportunity to sing a verse of “Love Hurts” onstage with Dan McCafferty and Nazareth on my birthday in 2004. † These are not the only covers of the song. To see a full list, containing over 40 versions (! ), click here. I'm re-reading 'The Sportswriter' by Richard Ford. I don't often read a book a second time. Debbie gave me all ten of the New York Times Top Ten Books for Christmas in 2006 and Ford's 'The Lay of the Land' was among them. It was unlike anything I'd ever read - equally hard-nosed realistic and dreamy-headed magical. The writing was alive, crisp, startlingly present and read as though every word had been polished – while at the same time seeming to flow like water from the mind of its protagonist Frank Bascombe - a man surprisingly recognizable to me. I soon learned that 'The Lay of the Land' was the most recent of three books chronicling Bascombe's complicated, yet in many ways pedestrian, life from 1986 (The Sportswriter) to 2006 (The Lay of the Land). 1996's 'Independence Day' covered the years in between. I dug out 'The Sportswriter' a few days ago thinking to check it as a benchmark of sorts. I've held all three books in such high esteem, I'd started to wonder if my current reading still held up or if, maybe, I'd placed the Bascombe books on an undeserved pedestal - creating an unrealistic and unfair reference point. On the plane to Toronto and back this past weekend I confirmed that, in the case of 'The Sportswriter' at least, the power of the writing remains undiminished. "Real mystery – the very reason to read (and certainly to write) any book – was to them a thing to dismantle, distill and mine out into rubble they could tyrannize into sorry but more permanent explanations; monuments to themselves, in other words." "When you are fully in your emotions, when they are simple and appealing enough to be in, and the distance is closed between what you feel and what you might also feel, then your instincts can be trusted. It is the difference between a man who quits his job to become a fishing guide on Lake Big Trout, and who one day as he is paddling his canoe into the dock at dusk, stops paddling to admire the sunset and realizes how much he wants to be a fishing guide on Lake Big Trout; and another man who has made the same decision, stopped paddling at the same time, felt how glad he was, but also thought he could probably be a guide on Windigo Lake if he decided to, and might also get a better deal on canoes. Another way of describing this is that it's the difference between being a literalist and a factualist. A literalist is a man who will enjoy an afternoon watching people while stranded in an airport in Chicago, while a factualist can't stop wondering why his plane was late out of Salt Lake, and gauging whether they'll still serve dinner or just a snack." These ruminations arise from Franks confusion about whether or not to tell Vicki Arcenault he loves her. These are not easy books to read and I'm not necessarily recommending them to you. An online check will show you that they are about equally hated and revered out there in the world. But since the books aren't as famous as some, and Richard Ford is still not a household name, I thought I'd share them here like I share the sometimes less-than-well-known music I love. Also, I want to write as well as Richard Ford - a goal that, although probably unattainable, will pull me forward like no wishing or hoping could do. Writing this post is, then, part show-and-tell - but also part declaration. I want to write as well as Richard Ford. Interviewer: How much rewriting do you do? Hemingway: It depends. I rewrote the ending of Farewell to Arms, the last page of it, 39 times before I was satisfied. Thanks again for this opportunity to participate! At 2:00 PM Pacific Standard Time, on Russell Hoban’s naming day when he come 86, the dark clouds parted and the sun shone down. I headed down to the beach with my lovely wife, yellow paper in hand. 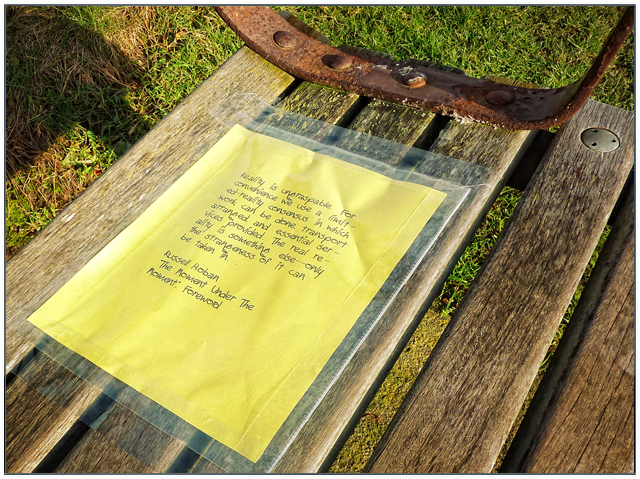 It was left on the best bench. Close to the water but distant from the action. A peaceful yet powerful spot. The wind was still whipping up the water. The gulls like that. “You see, one thing is, I can live with doubt, and uncertainty and not knowing. I think it’s much more interesting to live not knowing than to have answers which might be wrong. I have approximate answers and possible beliefs and different degrees of certainty about different things, but I’m not absolutely sure of anything - and there are many things I don’t know anything about, such as whether it means anything to ask why we’re here - and what the question might mean. I might think about it a little bit but if I can’t figure it out then I go into something else. But I don’t have to know an answer. Richard was also a helluva conga drum player. Connor's photography has been featured on the UK Blog 'G Squared' in a post called "and we Give You Connor McGuire". Check it there and also stop by his Flickr page to see some more of his work. Full band arrangement. Beautiful. And some pretty candid thoughts on the process. Six weeks, six new songs! I can't say he makes it look easy - as you've seen, it hasn't been - but I can marvel at the fact that he continues to create a brand new, and amazingly good, new song every week! This week's song is a hard-rockin' full-band-style arrangement, leaving behind the acoustic vibe from weeks four and five. Connor’s Week 5 song for his ‘Song a Week Project’ could be his best yet, despite the fact that it ended up being a ‘Song a Day Project’. The suspense is killing me! Every week of Connor’s ‘Song a Week Project’ has had it’s challenges. Week four was no exception. His plan to simplify the process by eliminating a full band arrangement and writing on an acoustic guitar just created a higher expectation for the lyrics - which became a struggle. I'm proud to say that Connor won that battle, and that “Getting Over It” (or whatever the official title will be) is a truly beautiful, thoughtful and damned catchy song. I’ve been singing it all morning! What Connor is doing with his ‘Song a Week Project’ is brutally difficult work. Making something from nothing - the delicate alchemy of songwriting - can be a gut-wrenching endeavour at the best of times, and doing it on a schedule like this is something I don’t think I could do. I watch his progress with a mixture of fear and loathing … and pride. Best yet! This was a really good idea. It was touch-and-go, but Connor has managed to complete his second song in time for week two of his “Song a Week Project”. As a not-uninterested witness to the unfolding events that he chronicles on the making-of video, I can confirm for you that there was a significant amount of dramatic tension and excitement involved. This instalment features guitar by Jim Black, visit to the best studio in Vancouver, Connor’s alter-ego “Pack Mentality” rocking the house and, of course, the finished recording of the song. Honestly though, the best (and funniest) ten-seconds opens the clip, with Connor attempting to remember the date. Connor decided a week ago that he would try to write a song a week. Then, in a moment of what I would characterize as foolhardy overconfidence, he added a video camera into the mix - recording the emotional peaks and valleys of his pressurized songwriting process. As most parents probably would, I gritted my teeth, far more concerned about the outcome than he seemed to be. And, although he started out strong he had ground to a halt by the middle of the week. It’s Russell Hoban’s 85th birthday today and I celebrated it by writing this quote on a piece of yellow paper and taping it to the side of the large white rock that my city was named after. All around the world, pieces of yellow paper with quotes from his books were left in other public places - cafe tables, bookshops, park benches, telephone booths, train stations or anywhere the birthday celebrant deemed appropriate. 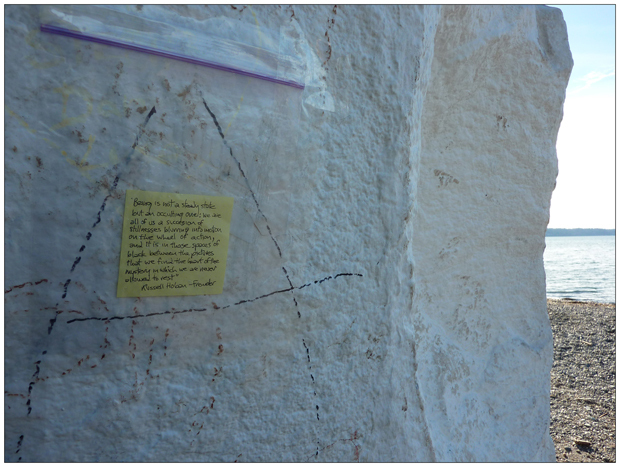 The SA4QE (Slickman A4 Quotation Event) website lists 350 quotes that have been left, on his birthday, in big cities and small towns in 14 countries since 2002. I am still the only Canadian representative listed on their site, but I know at least one other Canadian who leaves the yellow paper anonymously for the simple joy of having done so. It was a beautiful morning in White Rock and a perfect day to celebrate the “moment under the moment” that Russell Hoban explores and illuminates in his wonderful books. He remains one of the most original writers of the twentieth century and one of my very favourites. Just before New Years, I began writing an ‘end of the decade’ piece chronicling my frustration with the general lack of trustworthy sources of legitimate and reliable information in this digital age. I researched carefully, in order to accurately present both sides of conflicting arguments championed by intelligent and convincing spokespersons. I sweated the details so that my dilemma would be clear. Both sides can not be right, and finding the truth of a thing seems to be growing harder and harder as more and more information becomes available. I wrote the post using a beautiful and innovative new word processor that fills the computer screen with a peaceful white snowscape, eliminating all distractions. It truly seemed to help me focus exclusively on the writing. The essay grew long, but I was happy with the way it was coming along. On New Years day, I opened the file to finish it up. The serene white winter scene filled the screen, the program’s pleasantly unobtrusive music began to play quietly and my story appeared before me. In Chinese. Or Mandarin. Or Chinese (Simplified) or Chinese (Traditional) - other options I learned about from Google Translator where I later vainly attempted to return my writing to my mother tongue. The software’s website did have a reference to this problem. “If you get gibberish (oops)” they offered glibly, you could “try” their “workaround”. It didn’t work. I’ve contacted tech support but I am not hopeful. My Dad, a brilliant sculptor, used to tell people that he simply carved away everything that didn't look like what he’d set out to create. Watching him work, you'd swear he did just that - uncovering animals and people that had been waiting in the wood for his chisel to free them. I joked with Monty on Saturday night that I was hoping to use Dad’s approach to finish my submission for this year’s Three-Minute Film Festival. My rough cut had timed in at over an hour. I simply needed to carve away all but three minutes of that. Monty laughed, but I could see the look of concern in his eyes. Last year my film “Three Random Minutes” was exactly the correct length. As luck would have it – and it was dumb luck – my script had timed out perfectly. Possibly because of my rigid adherence to the festival’s format, I had wrestled the coveted Delores Award from my 3-minute film-making arch-enemy and two-time Delores winner Scott Milligan. I had no script this year. My bold plan was to film reality unfolding in real-time, in the hopes that I could glean three entertaining edited minutes. The filming resulted in over two hours of uninterrupted and extremely engaging material. Once I had logged the collected good bits, depression began to settle in. On Twitter, I wrote: “In any creative endeavour, exhilarating hopefulness begins to diminish near the ceiling of imagination and expertise”. I pretended for a day that I wasn’t making a film. I hacked and slashed all the next day. I prayed that the heart of the film was not lost somewhere in the digital blood covering the virtual cutting room floor. When I reached the twelve minute mark I stopped to brag about it on Twitter. It took another full day to attain the six minute mark. It took another to admit that the film was as short as it could be. Cindy and Monty’s Three Minute Film Festival is the best party of the year. We dress up, we organize into ‘magazine’ reviewer groups and post our reviews and votes on a big board on the living room wall. If you don’t bring a film you have to bring an appetizer. Most of the films are surprisingly awesome, but some are less than stellar. Sometimes they’re silly or in questionable taste and sometimes … like my film this year … they’re over three minutes long. I’m sure Cindy and Monty will forgive me. I’ll post my new 6 minute film here after it’s had its debut next week. I seem to be coming out of my ... I seem to be coming out of my winter! Thanks, in part, to Twyla Tharp, who I hopefully will discuss in a later post. Connor has posted two amazing new demos ("Be the One" - with his amazing new band, and "Brother's and Sisters" - on his own in the studio) here at his MySpace page. He's finishing up a third demo, "Give it a Name", right now. I can hear him mixing it upstairs. I went to see him at the Media Club in Vancouver last night *playing drums!! * with his good buddy Dylan Hossack. Turns out he's a great drummer too! For adventurous movie fans I recommend the totally ridiculous, over the top, goofily romantic and completely unforgettable Pola X.
I’m rapidly approaching the point where the only art I’m interested in is the art I appear to be unable to make.